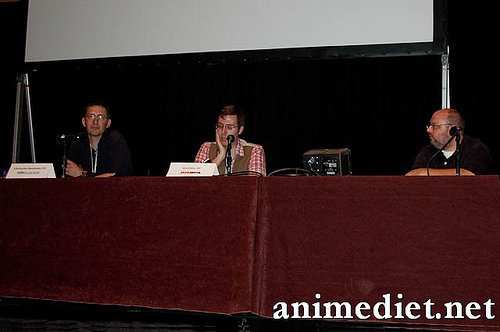 This was a panel moderated by Ed Sizemore of Manga Worth Reading, with guest speakers Brad Rice of Japanator and Christopher Macdonald of Anime News Network. This was a panel that was of personal interest for me, since I have spoken on occasion with Ed Sizemore on Twitter, and the topic is of writing interest. This blog entry is transcribed with questions asked and points made. As a disclaimer, I am editing some of the points to make this transcription readable. Even within the block quotes, please be aware that there are some editing points, that is not the same as the audio. I was recording the audio, so it is also going to be available soon. Ed Sizemore has also graciously provided a podcast of his coverage on the Manga Out Loud Podcast. Ed Sizemore introduces himself, and mentions the purpose of this panel is going to be on the decision making behind process of generating a news story. Ed thanks Anime Diet’s own Moritheil, and Johanna from Comics Worth Reading, both of whom were not present at Otakon this year. Why Journalism for you and what led you to creating an Anime Journalism website? Macdonald – The answer is not really helpful, it was a hobby. Before the anime industry exploded in America, I decided to take over Anime News Network, which has already been around for two years. Justin Sevakis founded the website to fill a need. That’s a very important part of the answer, seeing something with a demand for, and filling that need. So we’re not talking about finding a job, but anytime there is a need to do a new business or start/launch a website/publication, the most important thing is to not look at what everyone else is doing, to see what’s popular, but to look and see what people aren’t doing and what kind of interests are being unfulfilled. Rice -We started from the same perspective of fitting somewhere. From that point and for a totally different reason, we ran with it. Beyond reporting about the news, we try to have fun with it. This is something not really seen in the sphere of anime journalism. [Japanator] is quite like the Daily Show of anime, where we make jokes. We talk beyond anime, and on Japan. Ed brings out a scenario about receiving unconfirmed leaked information and the speakers’ reaction on it. The company used as an example is Funimation. Macdonald – Need to confirm it the leak with the people relevant to the leak or the side that has the power. Another issue is a core one for journalism: A is there benefit, and B is there harm? Upon leaking someone else’s information, you can harm them. With license negotiation, it is a borderline case, and it is a respectful decision to decide that there is not enough benefit to leak it now to the public rather than wait for a couple of months. With leaking, it may harm the negotiation. As a journalist, one would believe that journalists should be publishing every info they get. Anyone who believes that hasn’t studied journalism at all. Rice – Same thought process as, yet if the news is unconfirmed, how about going for an exclusive when the news is confirmed. That depends on relations with the company, but at least there was an attenpt made to get the scoop. Macdonald – When you get a leak, try to turn it into a mutually beneficial agreement. Rice – The anime market is really small, with 3-4 websites. Ed then moves on to talking about the confirmation aspect, taking the example of Anime Expo’s current problems with leadership/management. Why both sites didn’t cover this news actively. Rice – Don’t care about con drama. It just talks about AX, and won’t draw as much interest as a sensational story such as a girl being sprayed with champagne in slow motion would. Macdonald – Hate con drama, we got the memo. Info can be faked, and with the memo it was from an anonymous source. There are types of anonymity, where the press knows the source and anonymity is from a tip. AX’s case is the latter scenario. We receive some confirmation later, but it was never a source that we could publish or stand behind. Rice – You definitely have to rationalize the benefit of this scenario. Gossip vs. News. Macdonald– Someone did post it, and that is extremely irresponsible with no confirmation. I wished it was faked, so that it would be less competition. Ed brings up a further scenario of a competitor leaking that same news story, that you [speakers] decided not to run. Now what is your stance? Macdonald– We have to get solid confirmation, otherwise I don’t want to make a fool of ANN. People may complain on how late we are for certain stories, but I rather be the last one correct, than the first one to make a mistake. Ed mentions the feeling of responsibility on posting a news story. Internet publishing often gets the impression that it is not a real story, but right now blogs are being taken seriously. Comment from the speakers on the responsibility of publishing on the internet. Macdonald – There are many types of Internet publishing, ANN is old school and looks at the model of traditional newspapers. It is absolutely important that everything we publish is right, and when it is not – then we are responsible to making the correction and let our readers know about it. It is critical, and if we don’t then we have no business calling ourselves the internet’s most trusted anime news source. Rice – We write to entertain, and when we cover a breaking story where there are unconfirmed spots, we would admit that we will keep readers updated when the news get confirmed. We are similar to ANN. Ed mentions about how small the anime/manga industry is, with companies that support ads. They are also the exact same companies that will be reported in the news. What steps does your organization take to maintain an editorial freedom from influence, be it news, commentary or editorial? To make sure that writers won’t feel influenced by the company that they write for? Rice– Easy, we let other people take charge of the ads, money is in one hand and editorial is in other, so there are no conflicts like PB&J sandwich smashing together. Often if our boss said we can run a contest, we don’t mind – since our readers like free stuff. That’s the closest that these issues mesh with one another. Macdonald – I wish we can be like that. In theory we should have a wall like that, where we are 110% free from the people handling the money. The ultimate boss of the company shouldn’t be involved with the content of the editorial. Unfortunately at ANN, I am the CEO and the Editor in chief. We try to keep that philosophy, where I don’t bring money issues to the writers. In practice, we are separating money from editorial, but we’re not in that perfect situation yet where no money is crossing over. I am the only person who crosses over, and I wish I didn’t. It is tricky. Funimation is the biggest company in this industry, and they are very understanding. We get the most money from them, and occasionally there are reviews that trash their products. They have no problem with that, but for some other companies – there are complaints and I mention sorry, but we won’t retract what was said. There are minor complaints from marketing people, but PR people will go and tell them to calm down. It is a bit trickier with Japanese press, since their news is so tightly intertwined with the companies. News is dictated and controlled by the companies, and how much money was given to write about the product. We may have lost several ad contracts that way, but I’d rather hold onto my self-respect and respect of my writers than to be censored like that. Ed – I write without a company, but have there been companies that have come to you, and mention that if you’re going to write a negative review – then don’t post it at all? Macdonald – There is a school of reviewing that feels there’s no point in talking about content you don’t like and only talk about the good stuff. Personally that is a load of BS. We have never had any companies that came back to. There are marketing complaints for certain titles, but they don’t have the final buying or spending decisions, so we have never dealt with a situation like that. Ed- Comment about the common flaws that you see from the people online that call themselves journalists. Rice – The only thing that gets my goat is anime sites that will blatantly ignore sources. Sankaku Complex regularly does that. I noticed the new editor on Anime Vice doing that as well, completely ignoring [sources]. Such as this example: K-on in Japanese census, we found our source from MyAnimeList as a tip. Anime Vice has it on their site a few days later, with the same links and only sourcing the original Japanese site, so I know that you can’t just stumble upon this same content, so it is being lazy and not being truthful. Macdonald – I am not repeating what was said, but I am 100% behind what was said, it is a big annoyance. I am not a professional journalist, or at least I am not a professional educated one. Mistakes I see in many amateur journalists are mistakes that I have made ten years ago. Training and experience are worth a lot. Many people make the mistake of thinking that they can sit down and write without a journalism education, that with just information, can write proper English and have a website then you’re done, but that’s not true. You can get it through experience or training, but there is a lot you have to know in order of doing it properly, so the mistakes that you see are from people who don’t have the education or training. The understanding of journalistic ethics, the way of treating sources, crediting sources, doing proper research and value-add. Are you a Journalist or an aggregator? Anime News- 90% is aggregation, and there is a desire to have original content, but upon picking up a newspaper 90% of what they do is aggregation as well. So you can aggregate and copy what someone else did without a source, or you can aggregate and value-add, which is what Japanator did with the K-On story. They took a story, and then added their own content, so that brings value. If not then what was the purpose of adding the original story in the first place? If you’re just repeating what someone else said, then you’re just a waste of space. It is nasty to say, but ten years ago when I had no experience and making the same mistakes, there was no one else around, but now if you’re entering a market as a professional. Many of ANN staff has journalism degrees, people who do the job better than I do. So if you want to enter into this field, you don’t have to get a masters or bachelors, but do take a course or spend a ton of time reading up on it and really learn this subject. Go intern at an existing website, (ANN has hired interns) in a year, and they learn a lot. Guarantee with six months, but if you definitely got the option, go intern at a real newspaper, forget niche market journalism. Ed – What is the story within the last year, since the last Otakon, that impact guests, whether on a personal level or impact the industry as a whole? Macdonald – Everything that happened at ADV films had a lot of impact on the industry. The biggest thing going on right now is the fact that the industry is slowly falling apart financially, and this is a slowly ongoing issue. It is not an event that one article can cover, it is an evolution. Ten or twenty years after this, when you read about the history of anime, the period of 2007 to 2010, would be a scenario of what the hell happened here. Macdonald – That’s another issue, we’re always driven by time-sensitivity of a story. Presenting it as facts is hard, so there is the issue that you have mention, but if we even try to get facts and names together. It is not easy to be authoritative at this point. We can fall back on the reputation of our name (ANN), but we would rather have a scenario of trusting what another person, particularly an Anime corporation has said, rather than journalists. Rice – I remember last year’s Otakon, when Yamamoto apologized for the second season of Haruhi Suzumiya, and I remember when people got back to me on not putting it up, but it happened in a public space with people filming. Macdonald – Going on tangent, since this is a big issue with niche journalism. We’re talking about the company, when even the company doesn’t have a professional outlook on things. People are up at panels, and they say things as if they are in a private conversation. In an industry panel, even the Marketing director of a particular company made a license announcement where the presses are told not to write about it. Regardless of amount of attendees or who they are, that is a public event. Might as well put out a press release, since we’ll cover it – like it or not. Because in niche market, there are people in the company side who don’t comprehend this scenario, so if I don’t write about it…. Rice – Then I will! Macdonald – Yes, and we got to stay ahead of the game. This panel ends with some audience questions. Have you ever been contacted by major media corporation, like CNN or NBC on quoting about anime news? Rice – Every single day – [indicates Macdonald] Deb Aoki got me once on a local news media at last year’s AX, but my part ended up on the cutting room floor. Macdonald – That’s often the truth [cutting room floor]. Every single day is a big exaggeration. Journalists will talk with other journalists for an hour, you notice I ramble, but I give them tons of information about their story, and all sorts of info they don’t know. But upon submitting it to the editor, the editor would say space… and end up cutting us. We talk to mainstream press a couple of times a month to be friendly, often if we are quoted, we get cut or not then that’s nice. How do you deal with a leaked story (Vertical’s Ayako), where it is leaked and not publicly announced? Macdonald – I wasn’t consulted on this, since the news editor would know how to handle this story. Rice – Out of respect to Vertical’s Editor, since the story is probably not licensed finally yet, then I wouldn’t run it. But if other sites like Amazon leak the story, and other news site or Kuriosity runs with the story, then I would stay away. There is a fine line of respecting the relationships. How do you feel on the time when news of Greg Ayres health suddenly happened, and news coverage was made with no confirmation? Rice – We didn’t cover it at that time. Macdonald – ANN completely fucked up that coverage. I wasn’t consulted about releasing this news story at the time. I try to be hard on my staff, but definitely wrong decisions were made. It happens, and is unfortunate; it is a situation when a personal event happens to a public figure. I try not to be tabloids and cover a person’s personal life as much as possible. At that time, friends who weren’t related to the event were contacted, and were told to go contact the family. But the family wasn’t up to coping with the press. We apologized for that time, but it definitely brings up the point about an official unpublished rule on taking down articles, and not talking about it. It comes to when a person’s privacy was invaded, so we will take down the article without showing you the original. But I do need to publish that policy, so that people should know about this policy. They sound pretty bitter and to some extent condescending. I don’t see how linking to the same site that ANN links to instead of linking to ANN as lazy or deceitful. Thanks for the comments to Jan S. and Jura. @Jura, Writing is an area of interest for many people, so I do believe it is a matter of perspective. Most of the cons I have been to, I have always been interest in the “writing panels” and for this year – while I didn’t see as much of a personal blogger perspective – anime journalism is going on a professional level, since it is a niche writing. So if you didn’t want to end up as not crossing your i’s or t’s then it is better to value add. Who would cover the news first? Also I don’t believe links would all end up linking back to ANN.. I really do wish I could have been there. Thanks so much for this! I’ll have my own thoughts after I review this in detail. You were missed. What was interesting about this panel, for me – was how this took place of what I normally would see as the anime blogging panels. So it was interesting for me to see two the well known anime news/variety show talk – ANN and Japanator.